With the Olympics going on (in my own hometown, by the way, and it’s kind of strange to watch figure skating taking place in the very same arena where I attended an ABBA concert in my misspent youth), we’re hearing the word “heroes” tossed around a fair bit. And if we’re going to take that word lightly, let’s take it to the movies as well. Last night, I saw the new Kevin Smith comedy “Cop Out,” and it is Not Good (more on that when I write the review later today), but there was a hero in it: Susie Essman, who plays that lady who swears a lot on “Curb Your Enthusiasm” and basically does the same thing here, but she was funny and made me laugh and enjoy myself for maybe ninety seconds or so, which is more than I can say for Bruce Willis and Tracy Morgan. — Anna Kendrick, who in “New Moon” plays a teenager far better (and far funnier) than any of the actual teenagers in the cast. — Marion Cotillard in “Nine.” Somebody explain to me why Penelope Cruz got the Oscar nomination, when Cotillard, for the four minutes or so of the song “My Husband Makes Movies,” took “Nine” to an entirely different level. — Hugh Grant, in “Did You Hear About the Morgans,” or really anything he appears in. Not that he’s ever surprising, but he brings that mildly amused Hugh-Grantishness that’s always welcome. 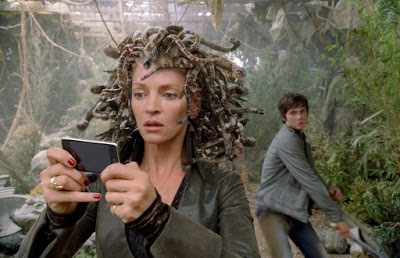 — Uma Thurman in “Percy Jackson and the Olympians: The Lightning Thief.” Or, rather, the CGI snakes Uma wore on her head in this movie as Medusa, and the weird but compelling way her hissy performance seemed to enhance them.